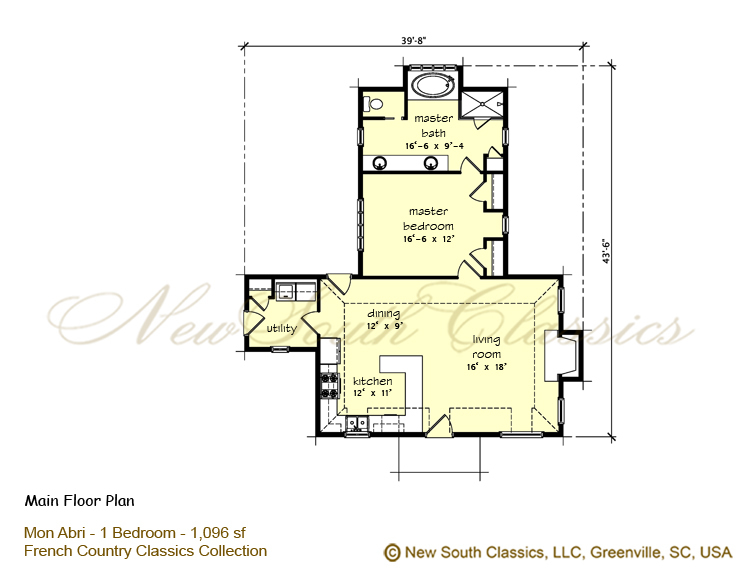 The resurgence in popularity of the "not so big" house has inspired us to create our efficient, functional, attractive and affordable Cottage Home Collection of French Country Cottage Plans. 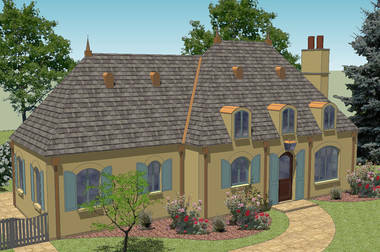 Our cottage house plans have the appeal of true French houses. From the buttery-tan stucco so typical of the area, to their style, and proportions, these cottages seem authentic and right at home in many settings. 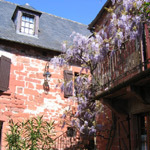 The main difference between our cottages and those they resemble in the French countryside is the size. 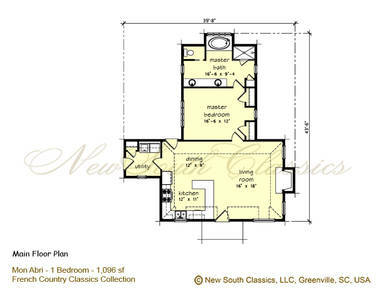 At 1,096 square feet for the one bedroom model, our Mon Abri Cottage lives surprisingly large. Its open, airy, light-filled spaces are a pleasant surprise and make this cottage feel much larger than it actually is. One could almost think he had stumbled upon a true French cottage in Normandy when approaching our Mon Abri! Casement windows set in buttery-tan stucco, clerestory windows that fill the inside with sunlight, rough slate stone pavers lead to the front door and the familiar steeply pitched roof define this French cottage house plan. Upon entering, your eye is drawn upwards to the high beamed ceiling and the sun streaming in the clerestory dormers. A large fireplace draws the eye to one end of the great room while an efficient, open kitchen and dining area opens up for easy entertaining and gracious living. The generous master suite and bath offer privacy and comfort overlooking the terrace and back of the property. Large casement windows in the bedroom and over the tub allow for abundant natural light and afford great views. If you need an extra room for a guest or family member, our two bedroom model at 1,323 square feet easily expands the one bedroom model with a great guest suite. If you prefer, this model would give you that home office you want. It could double as a guest room! 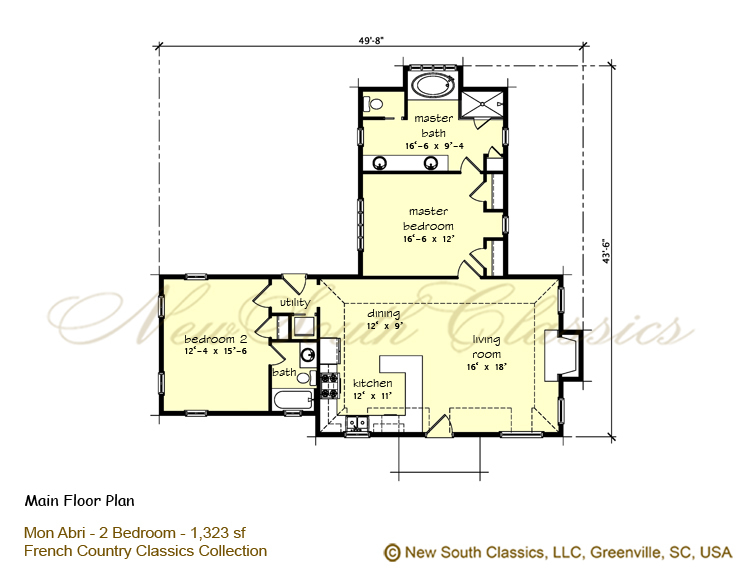 2nd bedroom, den, or home office!